"This was pretty good for a children’s book. It did not insult readers intelligence but definitely played to its demographic. It was interesting, multi-layered in story but still easy to follow. The characters were entertaining. The situations ridiculous and all fit for what I believe the book wanted." 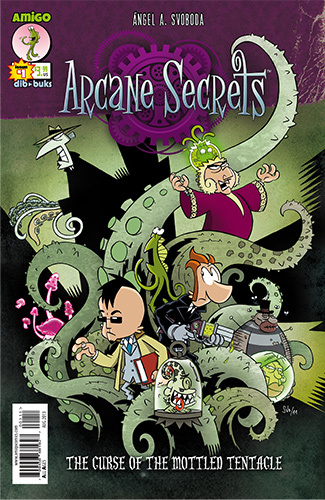 "It is truly ideal for young readers and early teens to introduce them to the comic book universe whilst promoting reading"
"By using humor, colorful and Cthulu influenced monsters, as well as a visual style that I’d best compare to the Phineas and Ferb cartoon, they’ve succeeded in what they set out to do." "The one-liners are often fast and furious"
"One of the best comic-books for all the family that I´ve read lately"
"It´s refreshing to discover works like this, where you are able to enjoy a story that focusses on reader´s entertainment using artists` tools common to Ibáñez ("Mortadelo y Filemón") or Jan ("Superlópez"), adorned with freak touches"
"Readers will enjoy the numerous tributes that appear in the comic-book"
"It has made me regain my faith.This comic-book is very eye-catching, the edition is brilliant, and the drawing is very attractive and colorful"
"How cool, how fun, what drawings, how fresh, what everything!!" 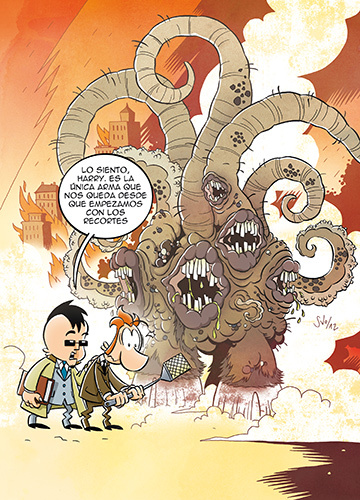 "The author structures a entertained story with persecutions, schemes and conspiracies to the end of the world, which recalls Lovecraft, that use as an excuse to have a good time"
"A very enjoyable comic-book filled with a lot of ideas, a great imagination, good script and drawing, in addition to lots of humor for all the family"
"Sorry, Harry. This is the only weapon we have after we start the cut backs"
inspired by the Cthulhu Mythos by the master of Providence, H.P. Lovecraft.